This was a great place to stop for a quick bite. It was really cool to see all the memorabilia on the walls. Also interesting to watch the old music videos playing on all the TV’s around the seating area. The food was great, the service was fantastic. It was early in the afternoon, and the place was pretty empty when we arrived, but it started to fill up pretty steadily while we sat there. We had walked past in the evening previously and the line up was out the front door to the attached gift shop – so I would recommend making a reservation if you’re planning to come for dinner. This was our second day on Pier 39, we had come back to take a harbor cruise, and see if there was anything else worthy of attention. We were both peckish, and had plenty of time to figure out our day, so decided to get a bite at the Cafe which was basically right next to where we were standing. 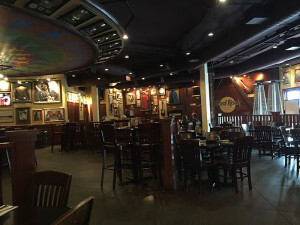 I’ve never been to one previously, I found it interesting that you had to walk through the gift shop to get to the restaurant, probably a good marketing ploy. I’m not really in to music so didn’t bother to look around. The shop was pretty big and looked like it had stuff for everyone. The restaurant was cool, very open with a raised area in the middle and lowered around the outside. Probably all the better so you could see all the stuff on the walls. 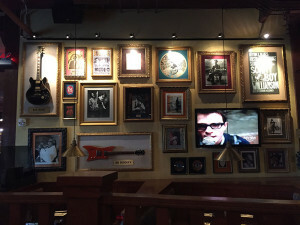 Katie said every hard rock is full of memorabilia – which is a neat draw. The menu had some unique stuff, including a huge variety of drinks. 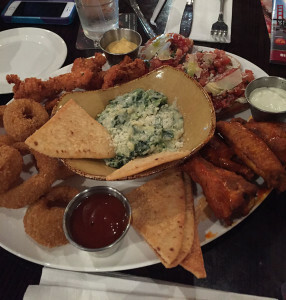 Since we weren’t having a full meal we opted for their appetizer platter that would let us try a variety of what they had to offer. 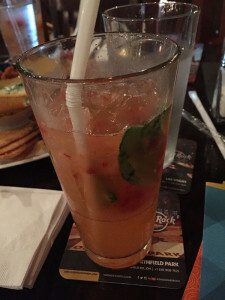 Everything was great, and the drinks were the best part. Definitely a place I’d like to try again to check out some of their meal items.